This Boy Crazy Mood Monkeys plush animal wants to know... "Who are you?" Let your mood and personality ring loud and clear... Boy Crazy! (And who of us girls weren't a little boy crazy at one time or another, right?) 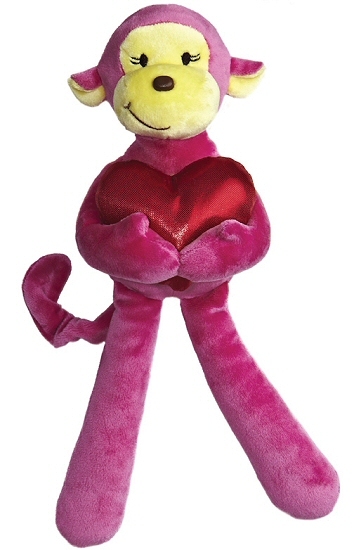 With a big red shiny heart in her hands, this Boy Crazy Mood Monkey has soft hot pink fur, yellow accents, a long curled tail, and fun embroidered eyes and lopsided smile. This adorable little Handfuls stuffed monkey has soft brown fur, cream accents, and a sweet smiling face.